I suspect a time-lapse sequence of me knitting a sleeve would resemble those speeded-up nature documentaries of a spider building a web: those long, slow circles round the outer edge, gradually getting faster as it nears the centre, until it’s just a blur at the bullseye. So it is with me. The top of the sleeve is a bit of a slog, but by the elbow it’s picking up speed, until by the cuff the needles are no longer visible and Einstein’s theories of matter and energy come into play… Well, a girl can dream. The problem is, of course, the number of stitches in the row is about the same as the back or front half, with the gusset added on; and it takes a while for the decreases to noticeably kick in. So I’ve got into a routine of doing an hour a night, i.e., four rows, and immersing myself in Joseph Haydn’s string quartets and piano trios, which may be the sanest music ever written. And sanity is certainly welcome right now. 1. The gusset was decreased at a constant rate of 2 stitches every 4 rows; now it’s finished, I’m switching to 2 stitches every 5 rows which I plan to maintain all the length of the sleeve to the cuff. 2. One of the drawbacks to using double-pointed needles is that when you move from needle to needle, the first stitch on the new needle tends to be a bit larger than the rest. Unless you move the stitches around the needles a bit, you can end up with a line of these uneven stitches running all the way down the sleeve, which looks terrible. On the other hand if you follow the advice the books give, which is to move the stitches around one stitch per needle per row, you end up with a noticeable diagonal line running all the way down your sleeve and around it! (This is very obvious with plain knitting, though as ever washing and blocking cover a multitude of sins.) My solution, which seems to work, is to leave the stitches on their needles for 4-6 rows, then move them around by 5 or so stitches, and so on. In theory, this should leave lots of little lines all over the place but it never seems to show. And of course, when you’re working to a pattern, then the number of stitches you move around can be adjusted to fit the blocks of pattern. Brilliant, eh? Hello – your work is great and I love the cream gansy you’re working on. 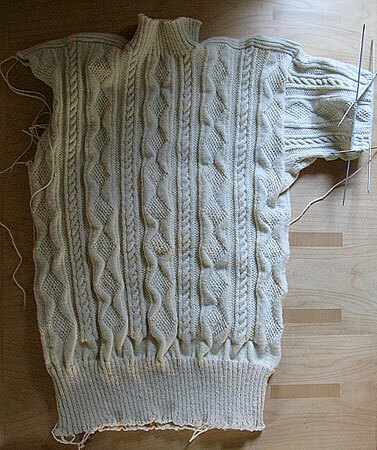 I’m interested to see (this is not a criticism) that the bottom of the body ribbing on yours looks a bit wavy. Is this because you used the wool double for the first few rows, maybe? And does it notice when the garment is worn? I’ve been knitting (like, forever) a Humber gansey from Flamborough Marine and mine has the same wobbly thing at the bottom (only possibly more so.) The pattern instructed you to use the wool double for the first inch or so. Only I think mine is exacerbated by the fact that i kept changing my mind about whether to use the huge dpns supplied with the kit or circulars, which affected my tension. Hi Honor, thanks for the kind words and thanks for posting. You’re quite right, the bottom of the ribbing IS rather wavy! ; I think the reason for it in my pullovers is that I cast on and then do a couple of rows in purl before switching to the regular rib of knit 2/purl 2. When the ribbing starts to concertina in after a few rows, these purl rows aren’t so flexible and as a result you get this wavy “clam’s lips” effect at the bottom edge. It isn’t very noticeable once you wear the finished sweater, as the ribbing stretches over your hips and anyway the eye is drawn to the pattern, not the edges. (That’s the theory, anyway!) Nearly all the other sweaters featured on my site use the same ribbing technique, so you can judge for yourself how they look from the photo gallery. 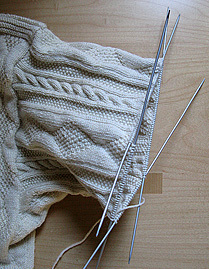 For what it’s worth, my advice would be not to worry about the ribbing too much – it’s the yoke people tend to notice.